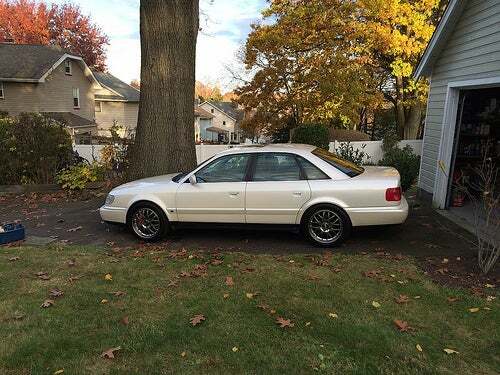 Call me a sucker for simple, non-flame surface, 90s 3 box styling, but I fell for the Audi’s svelte lines in a big way. The red Porsche 993TT calipers peaking out behind the BBSs sealed the love affair. And just like that the S6 was a winter beater no more. Fast forward to 2 weeks ago, and my S6 was giving me the stink eye as the NJ flurries falling from the November sky began to stick. I consoled myself - and more likely the car - by spraying down the underneath with WD40 and giving the paint a thick coat of wax before the NJ salt sprayers did their best to assault everything metal. It didn’t help because later that evening, I began scouring Craigslist for anything that would fill the role of a winter beater. I briefly considered a 1988 Buick Century for $700... these were desperate times. 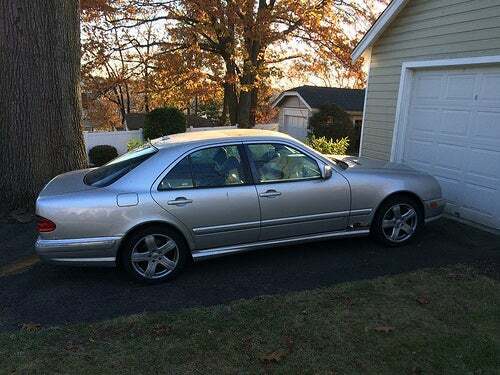 And then, as if by divine intervention from the Audi Gods, the ** PERFECT ** winter beater presented itself on one of the Mercedes forums. 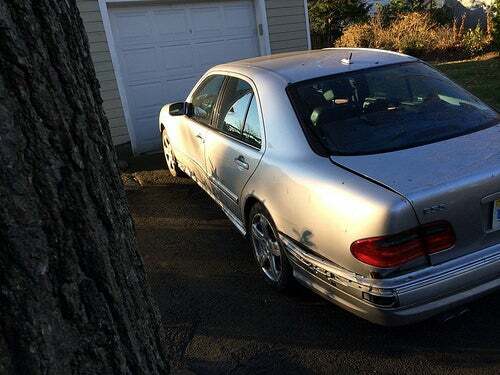 There it was, an honest to God 2001 AMG E55 that had been lightly hit in the driver’s rear and the owner was accepting offers above scrap value. And the car was practically in my backyard. 1) Get to the car as quickly as possible and ask questions on arrival. Asking questions through e-mail or text will most likely irritate the seller and / or waste precious time, in which case someone else has already purchased said car by the time you get a response. 3) Have reasonable expectations. A near ATM money E55 is going to have some flaws no matter how nice the seller’s ad makes it sound. After trading a few PMs with the seller, I got his phone number and we chatted briefly. It was then he disclosed that the car had * some * rust and a dented driver’s door which allegedly happened when he took it to a body shop to get the rear damage fixed. On the plus side, the seller was educated and knowledgeable about the car and didn’t seem like he was in the business of selling cars. 6 hours later, I was stepping out of a cab getting my first look at the E55 in the flesh. It wasn’t pretty and if I judged a car on looks alone I probably would have gotten back in the cab. But I was in a posh neighborhood on NYC’s upper east side and I figured the worst that could happen is I have a nice dinner with my wife and go home beaten and beaterless. If the outside looked like hell the inside looked like it could have come from a different car. It was practically spotless, and the two tone leather seats showed little wear. 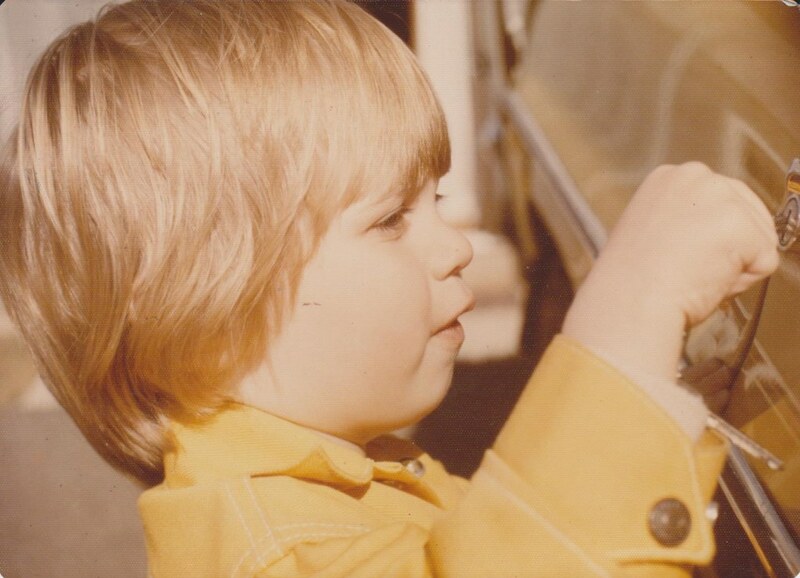 The black bird’s eye maple trim was crack free and the steering wheel was unmarked. The only eye sore was the after market Kenwood head unit. I then asked to go for a test drive. Upon start up, I was greeted with a menacing rumble and a quick glance underneath the car (which was incredibly clean and rust free) revealed the center resonator had rotted away. It sounded glorious and I vowed that if I bought it I would leave it until it fell off. We attempted to get out to the FDR for some highway driving, but even at 7PM it was at a standstill. I was able to briefly accelerate hard up to 40MPH at which point I asked point blank if there was anything else I should know about. “The car drives great, no shimmies, no shakes, nothing” was the answer, and for some odd reason, I trusted a complete stranger I had never met up until about 15 minutes ago. We completed the whole transaction inside the car, drug dealer style, parked illegally in front of a parking garage. Yep, I had entered the world of seedy, fly-by-night Craigslist “deals”, except I didn’t, because the title was legit and free of red flags and the seller was thoughtful enough to bring two bills of sale so we could each have one. He took a prolonged glance at his wounded warrior, shook hands with me and I was on my way. Did I mention it came with an extra set of summer wheels and tires? Honestly, driving through the city, I half expected the transmission to spit out its innards or something worse. But it didn’t. And then I was out of the tunnel, clear of city traffic and sink holes (yes, they’re are sink holes that will literally swallow your car) driving on Rt. 3. This was the first chance I had to bury the throttle... the transmission obediently downshifted a few gears, and wait for it... BAM!!!! 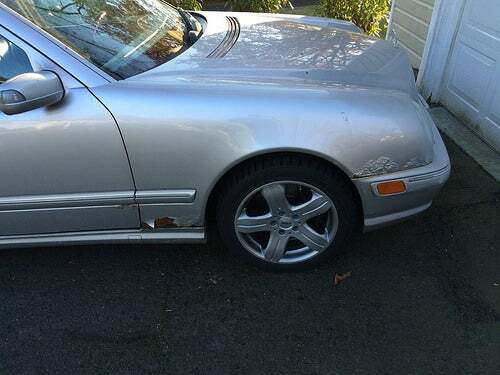 The E55 lunged forward with such urgency I briefly forgot that it ** only ** had 349HP. It may be a winter beater, but at least it was unholy fast. The next day, I inspected the car in my driveway in the daylight. The rust was even worse than I remembered. The bottom of the passenger fender literally wasn’t there. I could stick at least 3 fingers in there. The bubbles towards the front of the fender also looked pretty threatening. Circling the car, there was more rust to be found, albeit not as bad and no rot through. I briefly considered bringing it to my body shop and having new sheet metal welded in and getting the whole car repainted. Was I mental??!! The whole reason I bought this rust bucket was so that it could serve a singular purpose as a winter beater and keep my nice cars looking nice (and free of salt). So that settled it. 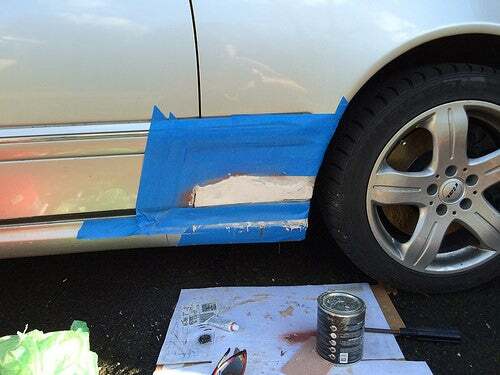 I would go the local auto parts store, invest in some sand paper, goggles, Rust-Oleum, GM silver spray paint (it’s actually pretty darn close), and Bondo and call it a day. As luck would have it, some unseasonably warm weather presented itself, and I instantly became an expert on rust and body repair. Well, not really, but one thing was certain: I wasn’t going to make it look any worse! I’ve put on roughly 1,000 miles, and so far - knock on rusty metal - this thing rocks. It’s solid, comfortable, and stupid fast. If you can keep out of the throttle, it even returns 22+ MPG on the highway. Stay tuned for an update at the end of this winter!